Lee Morgan blazed through the 60’s jazz world like musical wildfire. Lena Sherrod, executive director of the Shrine of the Masters Jazz Gallery in Harlem, has compiled a massive collection of the recordings and history of jazz trumpet great Lee Morgan. Mentored by Clifford Brown, Morgan was 18 years old when he joined Dizzy Gillespie’s big band in 1956. A top trumpet player, Morgan worked and recorded with the jazz elite; Art Blakey’s Jazz Messengers, John Coltrane, Wayne Shorter, Stanley Turrentine, Freddie Hubbard, Hank Mobley, Jackie McLean, Joe Henderson, McCoy Tyner, Lonnie Liston Smith, Elvin Jones, and Clifford Jordan to name just a few. Morgan’s 1963 hit, “The Sidewinder” crossed over into the pop charts the following year, and his “Search for the New Land” album, recorded in 1964 and released two years later, proved another commercial success. Eight prolific years later Morgan was gone, shot to death by his girlfriend on Feb. 19, 1972 during intermission of a set he was playing at Slugs, an East Village jazz spot. Morgan was 33 years old. On Sunday, Feb. 19, Morgan’s friends, family and admirers will gather at Harlem’s Shrine of the Masters Jazz Gallery for an afternoon of music in his honor. SOM Gallery is the home of a permanent collection devoted to Morgan’s life and career. The invitation-only event will also include a tribute to jazz promoter and Jazzmobile music contractor Jim Harrison, whose clients over the years have included the late Art Blakey and Betty Carter. Lena Sherrod, former finance and careers editor for Essence Magazine, founded SOM in 2006 and created the Lee Morgan exhibit, which includes 125 of the albums Morgan either recorded or played on as well as numerous pictures of his career. She was also a Morgan friend. “I used to do jazz production a long time ago,” which was how they met, Sherrod said. “I was out of the country when he died and a few years after I got back I decided to write a book about him. It was while researching the book that Sherrod eventually went online and “started seeing all these albums he had out that I had never heard of” that she decided to create the museum in a space she was renovating. SOM viewing hours are by appointment only. Call 212-368-9588 or email Sherrod at SOMJazzGallery@aol.com. 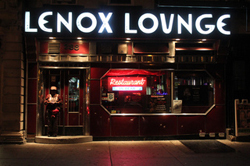 Harlem’s Lenox Lounge Is Marcus Samuelsson Eying It? The combined 3,285 square foot restaurant and lounge space, which was restored to its original glory a decade ago, will go on the market for $29,5125 a month.